A Korean language report released by the new Ministry of Science, ICT and Future Planning (MSIP) provides some interesting new information on how the structure of government is different than the prior two administrations. It clearly shows that the digital information revolution was central to the new President's thinking in reorganizing government. The report is titled "Science, technology and ICT leading to a realization of the creative economy and citizens welfare," (my translation) and is dated April 18, 2013. It provides some interesting detail on the scope and mandate of the new ministry, including the chart reproduced here (click to see a full-sized version), with English superimposed over the Korean text on the original. 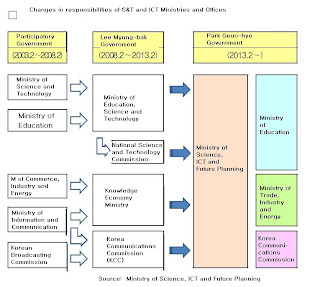 The chart shows the transition in the structure of key government ministries and offices related to Science and Technology and ICT from the "participatory government" of President Roh Moo Hyun to the Lee Myung-bak government to the present Park Geun-hye government. 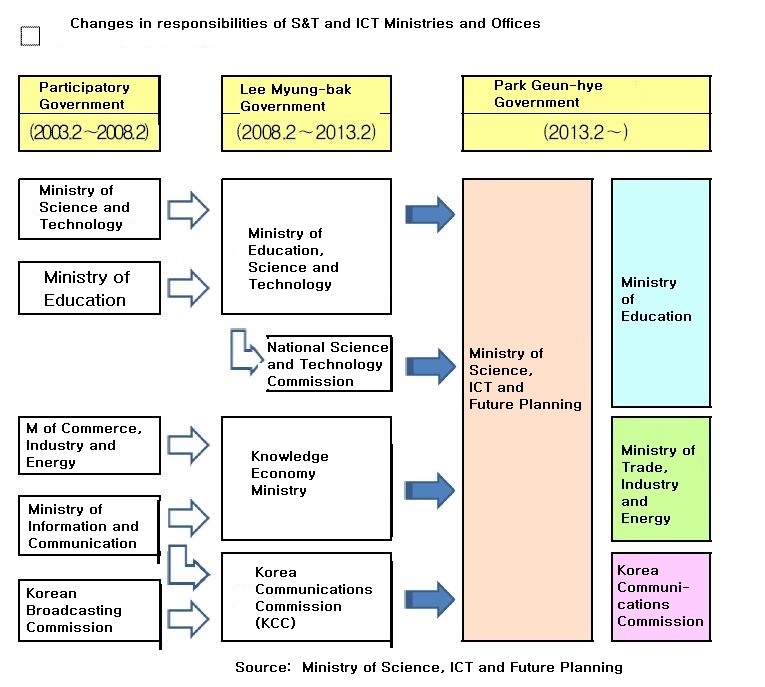 The chart provides an interesting view of how the Park Geun-hye administration not only put ICT industry and policy responsibilities back into a single ministry, but also merged it with science and technology, recognizing the broad manner in which the digital information revolution is transforming the economy and prospects for new jobs. More on this topic in future posts. Will Korea's "network powerhouse" phase continue in the future? Today I ran across a Korean language paper written by researchers at, Digieco, KT's economic and management research institute. They addressed some of the same topics as the conference paper I wrote with a Korean colleague and delivered annual conference of the Pacific Telecommunications Council in January. The title of the Digieco research paper translates roughly into English as "Will Korea's network powerhouse phase continue....the basis for future competitiveness." Up to this point, the paper notes, South Korea has become a digital network powerhouse through fierce competition among operators. The nation's status as the first country in the world to build out nationwide LTE mobile networks is but the latest evidence of this phase in South Korean development. A couple of other arguments made in the paper were interesting. For one thing, although it did not invoke the "information superhighway" metaphor, it explicitly drew the comparison between the impact of transportation infrastructure and digital communication networks, presenting the bar chart published here (click to see a full size version of the graphic). The top bar in the graph represents the duration (15 hours) to drive from Seoul to Busan on. The second bar represents the time required if driving on the Gyeongbu expressway, and the final two bars show the time required to travel from Seoul to Busan on the original KTX, introduced in 2004 and the newer version of KTX, introduced in 2010. A second argument in the paper that I found interesting was its conclusion. It notes that Korea, which began as a network powerhouse, has in recent years neglected this while countries around the globe paid more attention to it. Therefore, the paper argues, there is a need to pay attention to reducing the gap between Korea and other countries through a range of government investment support. It suggests the need for government leadership as the nation nears the end of its "network powerhouse" phase. I received a message this past week calling my attention to the infographic at the left (click on the infographic to see a full size version, or go directly to it at this link) Note that the comparisons of South Korea with the U.S. are on the top quarter or so of the graphic, followed by U.S.-specific information. This information prompted me to check Akamai's latest State of the Internet quarterly report, for the third quarter of 2012. It shows that Korea continues to lead the world in its average measured connection speed to the internet, at 14.7 Mbps, followed by Japan and Hong Kong at 10.5 and 9.0 Mbps respectively. South Korea is also the world leader in what Akamai calls "High Broadband" with 52% of all connections at a speed greater than 10 Mbps, compared with only 18% of such connections in the United States. When it comes to internet connections, whether fixed or mobile, speed matters. However, high speed broadband networks do not simply appear overnight. Indeed, the building of these new networks is a large, long-term construction project that requires massive funding, planning and leadership. The larger lesson from this infographic, along with considerable recent research and discussion in policy circles, is that the liberal, U.S. approach to broadband, "let the market and private sector handle it" doesn't seem to work well, when compared with the government-led, long-term ICT policy planning in South Korea. I've been working over the past several weeks on revision of a conference paper with a Korean colleague that examines the role of government leadership in the ICT sector, so this infographic was a timely reminder that policies and plans, or the lack thereof, ultimately affect the marketplace and consumers. It also reminded me to appreciate the gigabit network at KAIST and the high download speeds we enjoy here in the Daedok Innopolis. While Kansas City, Austin Texas and Provo Utah will soon get similar speeds courtesy of Google, over here in South Korea the entire nation will very soon be enjoying a gigabit network. Google chairman's recent North Korea visit and the "dark side of the digital revolution"
The Wall Street Journal has published an interesting article by Google's Eric Schmidt and Jared Cohen, entitled "The Dark Side of the Digital Revolution." It is based largely on their recent visit to North Korea, and provides an interesting current perspective on the dilemma that the internet and all new digital technologies and networks pose for the North Korean government. For example, they note that "Even the idea of the Internet has not yet permeated the public's consciousness in North Korea. 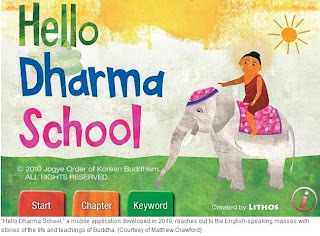 When foreigners visit, the government stages Internet browsing sessions by having "students" look at pre-downloaded and preapproved content, spending hours (as they did when we were there) scrolling up and down their screens in totalitarian unison." What makes this situation so poignant is that, just south of the DMZ is a society which is arguably more aware of the internet than any other country on earth. I recommend reading the entire article. Now that its Minister is formally appointed, news about specific activities planned by the new Ministry of Science, ICT and Future Planning is being published. As noted by Yonhap News, the "super ministry" plans to focus a great deal of money and effort in the coming several years on technology upgrades and job creation. Also, The Korea ITTimes is reporting that the ministry plans to spend KRW 31.5 billion nurturing IT talent. It reported that "The Ministry of Science, ICT and Future Planning (MSIP) will plough KRW 31.47 billion into fostering IT and IT convergence experts. The MSIP said Sunday it will provide KRW 22.17 billion to universities’ IT research centers and KRW 9.3 billion to projects aimed to nurture highly-skilled workers in the IT convergence sector.The MSIP’s two projects, “Support for University IT Research Centers” and “Project to Nurture Highly-skilled IT Convergence Experts,” will benefit about 2,200 college students and nearly 180 companies’ IT and IT convergence researches respectively. As for Support for University IT Research Centers, each beneficiary (university) will receive KRW 600 million to KRW 800 million annually over the next four years to make sure universities produce excellent IT workers in a sustainable manner and effectively carry out industry-academia joint R&D projects. This year, a total of 30 universities will be covered by Support for University IT Research Centers." Finally, the government has announced the official English name for the new super ministry that has been the subject of numerous earlier posts. As reported by Yonhap News Agency and other media, it is the Ministry of Science, ICT and Future Planning. The new ministry has also published a Korean language web site (view it at this link), with some pages still under construction. The Joongang Daily also published some interesting detail about the information made public by Anonymous after it hacked the North Korean site "Uriminzokkiri." As I noted in a short post yesterday, that information included records of the web sites 9,001 members, about 5,000 of whose e-mail addresses appeared to be in South Korea. The article included the breakdown of those addresses as shown in the graphic below (click to see a larger version) . The Joongang Daily Article also noted that the police, prosecutors and the National Intelligence Service (NIS) were checking whether the South Korean members had violated the nation's national security law. "If a South Korean exchanged messages with Pyongyang after becoming a member of the Web site, it would be a violation of the NSL’s Article No. 8, which prohibits people from communicating with people in the North and which can be punished with up to 10 years in prison. Posting words or images that praise North Korea is a violation of Article No. 7 and can be punished with a jail term of up to seven years, according to the NIS." The national security law is the main reason why South Korea ranks high on internet filtering as measured by the Open Net Initiative, but only in the political category, as noted in an earlier post. The cyber conflict involving the two Koreas took a new twist recently when the international hacking group Anonymous hacked an official North Korean web site,"Uriminzokkiri" . 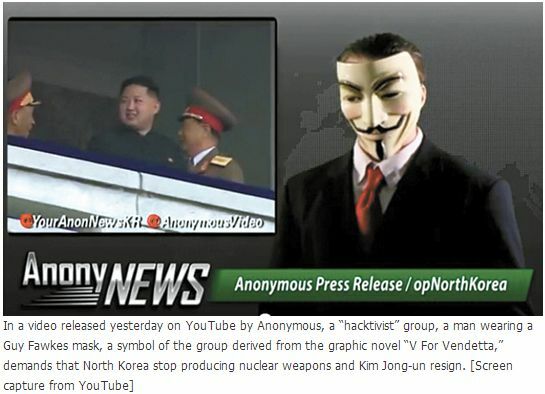 As noted by the Korea Joongang Daily, "Anonymous, a so-called “hacktivist” group, said it hacked into the pro-North Web site uriminzokkiri.com in order to tell Pyongyang to stop threatening the world and to warn North Korean leader Kim Jong-un to step down and give his people freedom. It leaked records of the Web site’s 9,001 members on Thursday including names, user IDs, dates of birth, e-mail addresses and genders. 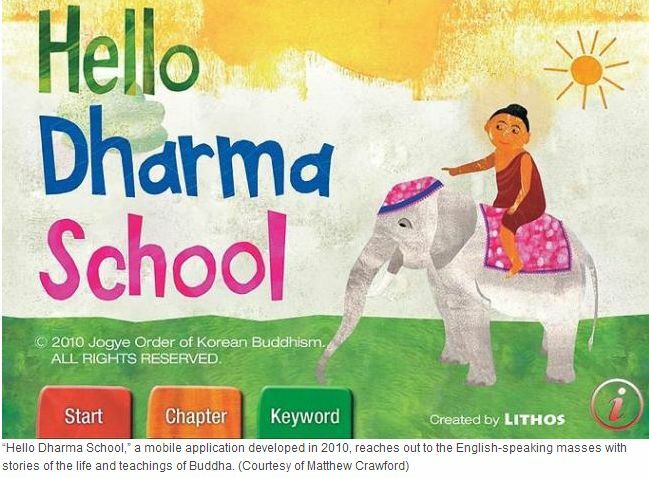 About 5,000 of the e-mail addresses were from South Korea."